We hear that communication is important in every aspect of our lives. With our spouse, our co-workers, our family, communicating effectively is the topic of a very large self-help section of the internet. I’ll let you in on a little secret. It’s the same with our dogs. Teaching people to communicate with their dogs is the #1 thing that I do. 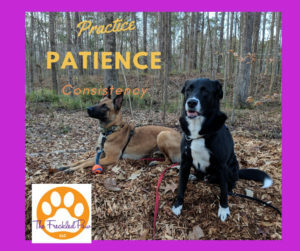 Those of you who have met with me, know that I am constantly reading your dog’s body language, and interpreting what I see, so we can help them (and you) the most effective way possible. 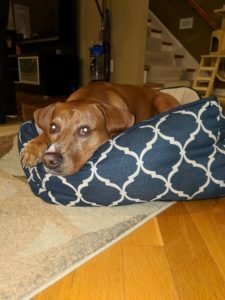 By teaching you how to read these signals, you can adjust your approach to help your dog cope with the situation and get through it successfully. Dogs are incredibly visual animals. They see details fairly well, and use those visual signals to communicate with each other. Kinda like sign language for deaf people. Here is a handout by Lili Chin (look up her illustrations, they are amazing!) 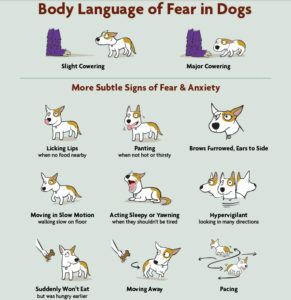 These are the signals that dogs give to each other when they are feeling uncomfortable in a situation. Watch your dog on their next walk. Are they displaying any of these signals? What has happened right before the signal? As you walk, do you notice more of these signals? What happens if you give them a cookie during this event? 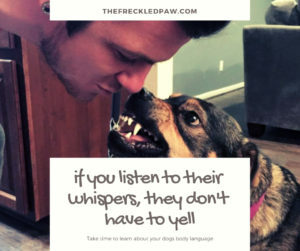 These are your dog’s whispers that they are not okay. If you listen to these whispers, then you don’t have to worry about yelling when something big happens. 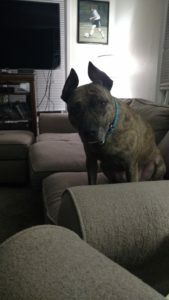 Do you have a dog who suddenly starts to bark at seemingly nothing? What about a dog who barks at other dogs? Start paying attention to the signals above while you are out. 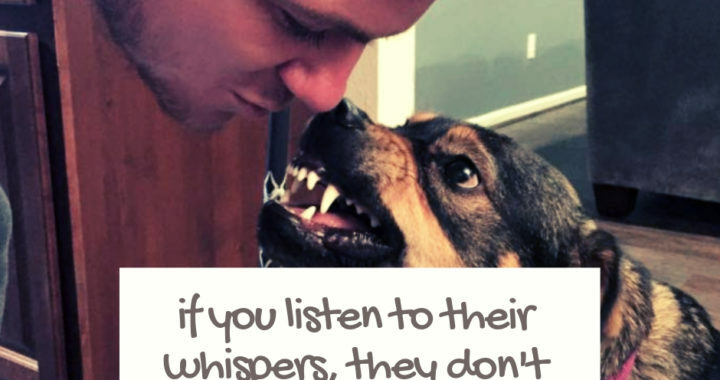 It’s listening to those whispers that are going to make you a great dog owner. 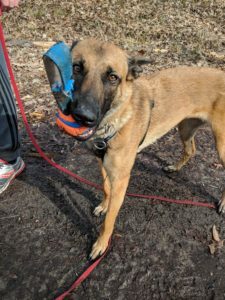 It teaches your dog to trust that you are not going to put them in a situation they can’t handle, and if they are struggling you are going to help them through it like a friend. They are our best friends, are we taking time to listen? Ice cream is always reinforcing! I think that was a title from a class I took recently. Reinforcement is a big word for a very easy concept. But one that is usually overlooked. 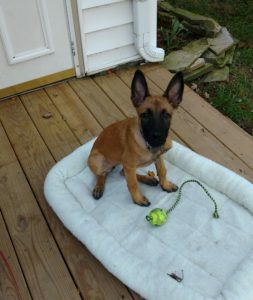 Reinforcement in dog training simply means pay your dog. Dog does something, reinforce it. If your dog sits during a training session, you would absolutely give him a cookie. But what are you doing the other 167 hours of the week? Has your dog figured out the game? Do they only listen in class, or when you have the bucket of cookies and the clicker in hand? Dogs do what works for them. Does it work for you? 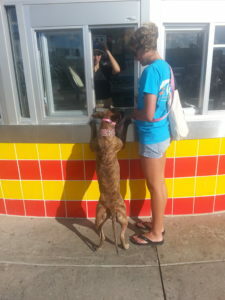 A kibble is a small price to pay for making sure your dog is being rewarded for the things you like. Many many reinforcement strategies in this situation. To Cargo, the sock is a fun toy. It’s stinky, and it flops around when she bites it. I don’t want holes chewed in my socks, so early on we taught a “trade” for food. Food is a better reinforcement than the sock, so it worked. 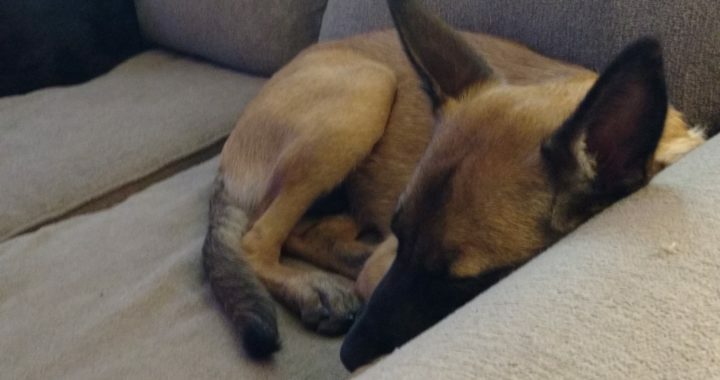 If I were to chase Cargo around the house to wrestle her for the sock, then sock would become an even better reinforcement because Malinois love to tug, and I would lose a sock everytime. (Not reinforcing for me!) For a reinforcement strategy to work it has to benefit all the parties involved. Because food is the better reinforcer in this situation, I have food in small containers stashed all over my house. If I had chased Cargo all over the house to get the sock back, I would be reinforcing the “stealing sock” behavior. Chasing and tug is also a reinforcer, but since I set up her options as drop the sock for food or have her collar held until she drops the sock. Food is the only reinforcing option. She’s going to choose the food. Now, she brings the sock to me to show me she’s found it, I reinforce her bringing it to me, and we do not have (many) eaten socks. In the kitchen, I only give her food when she is laying on the rug in front of the sink. Now, thats where she lays when I am in the kitchen. She gets a Kong or Peanut butter bone when I ask her to kennel, so she happily runs to her kennel when I ask. 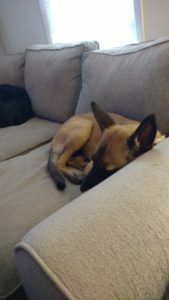 This is especially important for new adult dogs in the house, or brand new puppies who are learning how to live in our world for the first time. Putting some forethought into the behaviors you want to see in the future will help you to prevent the unwanted behaviors later on. Have any questions on this concept? Chat with us on Facebook. The next post will discuss what happens when this strategy goes wrong!